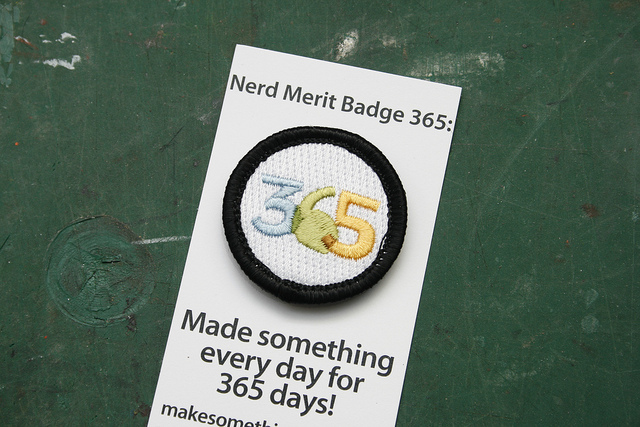 Find out more about Nerd Merit Badges HERE. Well, this will be very cool! I have earned Printer Hero, Homonyms (my stationery is not stationary), and Rubber Duck, but haven't bought any of them. Now that 365 will be one, I will be purchasing my three and on 1 Dec 2011, I'm sure I will have earned my 365 and I can add that one. Cool! I can't wait for this badge! I will be getting mine when Nov. 27th, 2011 comes around. What? Now we can work toward something more than just bragging rights and self-satisfaction? I'M IN! Postmuse, I'm already on the case - I've written an email to the badge makers to get a Mailart365 badge made! I have wanted an embroidery machine for SO LONG, and this gives me yet another reason to save for one. my 1 year 365 project's blogoversary is in 1 week. how does one get the badge? OK the details can be found HERE.